Get your game faces on. It's time for Halloween! ON HALLOWED GROUND: OK, so it's Halloween Weekend. Time to get dressed up, bob for apples, trick-or-treat, enjoy a little mischief, and have an all-around frightfully fun time. There are countless events happening across the state this weekend (actually, you probably could count them, but that would require unnecessary effort). Instead of telling you about each and every one of them (again, too much effort on our part), we've selected a narrow few. Plus, for those who scare easily, there are some non-spooky events happening as well. Enjoy! 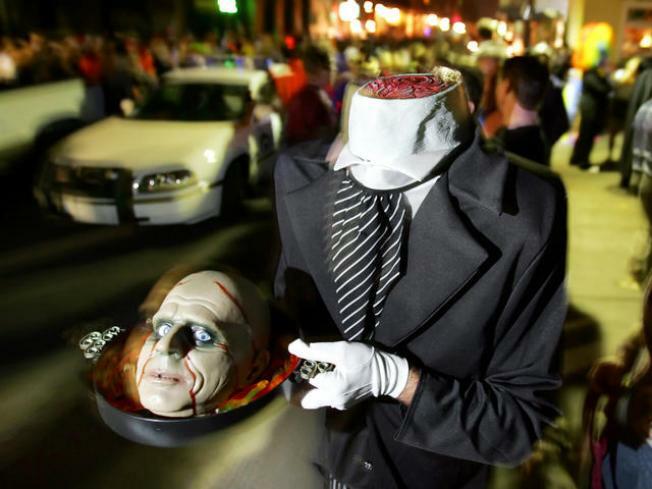 NIGHTMARE SCENARIO: Start your ghoulish gallivant Friday night in Downtown Hartford and the Nightmare on Ally Street Block Party. Dress up in your best costume and enjoy the eerie entertainment and the spooky spirits put on by Up or on the Rocks and Black Bear Saloon. Live music is provided by local acts the Zoo, Heroes and Villains and Enemy Concepts. Plus, there's five grand in cash and prizes available for the best single and team costumes. The party, which will cost you $15 to get in, begins at 5 p.m.
THRILL RIDES: Halloween is a special time at Lake Compounce in Bristol. Not only can you ride the rides at the park this weekend, but it's also their annual Haunted Graveyard. Friday night, the park will feature all sorts of eerie decorations and scary live actors who haunt the park. The festivities are rated PG for Pretty Ghoulish and small children should probably stay home. The gates and rides open at 5 p.m.
GHOST STORIES: One of the classic Halloween setups is a group of campers, sitting around the fire, telling scary stories. Friday night, head to Playhouse on Park in West Hartford to check out Campfire. The actors in the unique long-form improv show spin terrifying true stories into horrifyingly funny campfire tales. Tickets are $10. The show starts at 8 p.m.
GHOST HUNTER: Before TAPS and those weird guys on the Travel Channel, there were the Warrens. Friday night, you can hear all the classic ghost stories from one of America's most popular ghost hunters. Over the years, Lorraine Warren has experienced it all when it comes to the paranormal. And if you head to the John Lyman Center at SCSU, she'll share all those encounters with you. The event starts at 8 p.m. BLOOD THIRSTY: Halloween night, why not go a little upscale for dinner, before you go trick-or-treating. Sink your teeth into the "True Blood" Wine Dinner at Max Amore in Glastonbury. The six-course dinner is frightfully inviting and is paired with the wines of Casillero del Diablo (the Devil's Castle). And you don't have to be fans of the HBO show to sit down and eat. Dinner costs $66.60 (clever) a person. Reservations are requested. FAIR AND BALANCED: If all those events weren't scary enough. This one could prove to be truly terrifying. Glenn Beck and Bill O'Reilly are coming to Connecticut Saturday night. OK, just kidding, not too terrifying. The Fox News favorites are coming to Mohegan Sun as part of their Bold & Fresh Tour. And with just a couple days left before the election, we're guessing they'll have one or two things to say. Tickets cost $50-$130. The show (and what a show it promises to be) starts at 8pm. MUST WIN: Let's face it, things haven't exactly gone all that well for the UConn football team. But the season isn't over, and who knows, the path to resurrection could start Friday night. But the Huskies need all the help they can (we mean fans as well as quality QB production) get if they want to take down Big East Rival West Virginia at the Rent. Tickets for the prime-time 8 p.m. start are $35-$60. CRAWLING AWAY: Forget about Halloween and even Thanksgiving, Christmas, Hannukah and New Years. If you head down to New Haven Saturday night, it's all about St. Patrick's Day. The annual Pub Crawl to benefit the city's St. Patrick's Parade kicks off at Christy's on Orange. Other participating pubs in the crawl include Anna Liffey's, The Anchor, Kelly's Bar, Richter's, Stella Blues, Wicked Wolf and Old School. Tickets are $25, which gets you into all the pubs involved and their respective Halloween parties. The Crawl starts at 4:30 p.m.
LITTLE THINGS: For a few years in the '90s, there weren't many, if any bands bigger than Bush. Fueled by their debut album, Sixteen Stone, Bush soared to the top of the charts with hits like "Everything Zen" and "Machinehead." The band continued to blow away audiences for years before breaking up. But eight years later, front-man Gavin Rossdale has gotten the band back together. Saturday night, they're taking over the MGM Grand at Foxwoods. Tickets are $30-$50. The show starts at 8 p.m.